Here are some examples of the clients I work with, illustrating the kinds of work I do. Jini Yoga I was delighted to receive this second commision from Susan McHale, to develop a site for her business Jini Yoga. 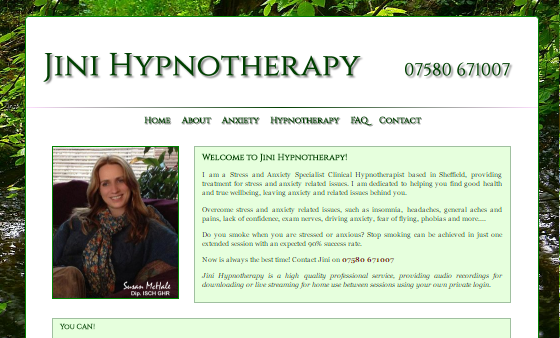 Sue wanted a similar look and feel to her first site, jini Hypnotherapy and for the both of them to be landing pages for, and integrate with, her strong Social Media presence. 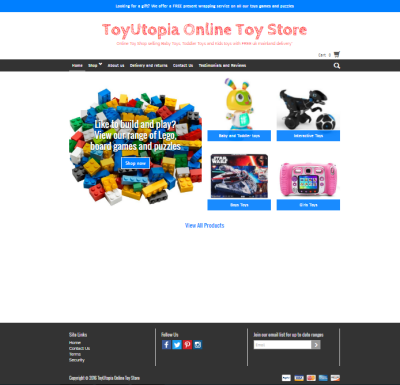 Toy Utopia is a brand new and exciting online shop selling all kinds of toys suitable for children from toddlers up to teenagers and beyond. I consulted on matters relating to Search Engine Optimisation for this client, with the object of getting the site recognised in the online market place as quickly as possible. We are still working on the many possibilities, but please visit the site and see for yourself the great range of toys that Jenny and Richard sell. 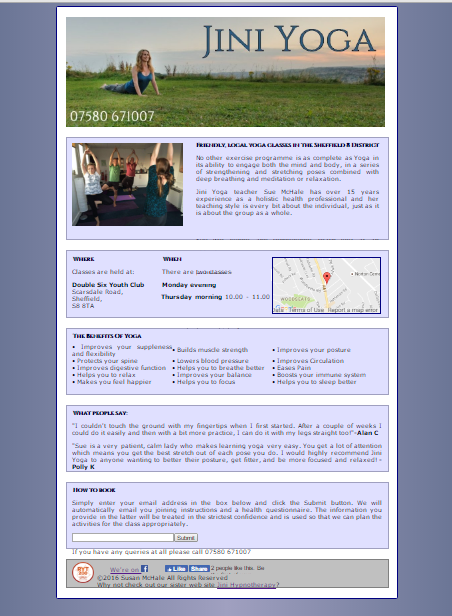 Susan McHale is a lovely lady who works as a clinical hypnotherapist in Sheffield. She specialises in treating people who suffer from stress and anxiety, but can treat the full range of conditions too. Sue and I worked closely together to create this site; it is undoubtedly the best graphic design I have done yet, and also represents some considerable technical advances in coding, being fully responsive and mobile and tablet friendly. Because Sue wanted to reach out to a potential client group who were perhaps hesitant about trying hypnotherapy, she has written several quality articles that dispel the myths surrounding hypnosis and to reassure them that the process is safe, effective, and actually rather enjoyable for the patient. Please visit the site and have a look. Sue also wanted the site to have a secure area that her clients could log into, and find there audio files that she has prepared for them to listen to in between sessions, or if they could not attend for some reason. These files are hosted on my servers and can be streamed live or downloaded, giving maximum flexibiity. Konny Scottthorne is an oriental dancer and teacher of belly dance working in Sheffield. I was very proud to be commissioned to write this very innovative web site, whose graphic design reflects both Konny's cultural influences and her personal style. The site starts with an animation of images of Konny dancing, leading to the front page. Further pages describe her styles and influences, performances, and there is a most impressive photo gallery featuring professionally shot photos of Konny in a variety of oriental dance costumes. It's a must see! Initiatec Limited is one of the fastest growing companies in the electronic security sector, providing services to police forces, local authorities and airports among many other prestigious customers. Their success has been largely due to a constant ability to demonstrate innovation and the use of advanced technology to provide working solutions in otherwise impossible situations. I am proud to provide IT consultancy, support and bespoke software to the company helping it to maintain is leading edge position in the market. The IT Trainer is a company that provides training to businesses across the whole range of information and communications technology. The company employs skilled trainers who deliver courses at all levels and with an emphasis on saving time and driving up productivity, by tailoring the course content to the client's exact requirements. I am delighted to work for the company in a variety of capacities, maintaining the web site and email accounts, working on software training solutions and providing IT support but also in the role as associate trainer delivering courses on bespoke software or those with a more technical content such as VBA for Access or Excel. Far Concepts Ltd is a joinery firm based in Dewsbury, West Yorkshire that manufactures hand-built interiors and furniture of the highest quality for both the commercial (shops and hotels) and domestic markets. By maintaining minimal overheads and controlling costs, the company is able to offer these products at very competitive prices. I am happy to be working for them re-constructing the company web site, providing web and email hosting services, general IT support and consultancy and also working with them to develop a digital signage product that will use an innovative, cost effective embedded Linux-based platform.